This review contains plot spoilers and is based on the UK preview of the episode. Steven Moffat's second Christmas Special returns to his first love as a Doctor Who writer: the theme of motherhood. Rather than that eerie question “are you my mummy?” instead we get young Cyril Arwell's stubborn assertion that “mummy always comes” to the rescue. And in a spot of gender amending, the Doctor further sums up events in two words: “Mother Christmas!”. But before we get to the maternal love-in – with the “basecode of nature” used as justification for assorted meanings of plucky, fierce mother's love – this episode has plenty of (forested) ground to cover. For one thing, its title is misleading three times over: the wardrobe isn't actually a wardrobe, the widow isn't ultimately a widow, and the Doctor isn't quite himself either – he's the caretaker, hiding from his own legend, and keeping away from old friends. This big festive episode also seems rather like the Who equivalent of a Christmas tree groaning under the weight of years' worth of different decorations – lots of shiny things are there on display, some of which you don't like, and some of which don't match. But if you look carefully, you'll always find something to delight. An impact suit that repairs its occupant; naturally-occurring Christmas trees; dancing chairs; a wintry forest wrapped in a TARDIS-blue gift box; wooden monsters who aren't really monsters. Androzani Major. Bill Bailey in a spaced-out hazard suit. Come on, admit it, that golden crown of fandom is starting to tingle and glow with life force. This is traditional rather than transitional Christmas Who fare, despite the fact that Piers Wenger hands over here to new queen bee exec-producer Caroline Skinner. My favourite shiny bauble is the fact that at about 44 minutes in, and after a quiet moment where the geodesic sphere spaceship lifts off, we suddenly cut to what appears to be a 'clean' version of the end credits' time vortex (at least, we do in the “rough cut” that I'm reviewing, so fingers crossed that this makes it into the Christmas Day broadcast). Rather than the production team's names whizzing by in the smallest font in the universe, though, we pull back to see the Doctor watching through a triangular window. It's not the end credits at all, crashing in at the wrong moment, it's the time vortex that Madge is selflessly piloting them through. But just for the merest split second you can't help but imagine you're seeing the eleventh Doctor gazing out at the end of a Doctor Who episode. It's a great visual, as Arabella Weir's Billis might say. Sadly, there is at least one major missed opportunity. It's a shame that after series six has focused on an under-developed and under-explored mother-daughter relationship, the values of being a mum can seemingly only be explored while Amy Pond is off the stage. Of course, all are well in the Arwell clan by episode's end, but I'd argue that Madge (wonderfully played by Claire Skinner) nevertheless gets more character development, and more plot beats surrounding her motherhood, than poor Amy Pond received in an arc's worth of material. It's as if Moffat can only really focus on developing wholly believable characters, and properly writing the mum thing, when he's not preoccupied with series arc plot-twists, or with which episode goes where in the run. Having said that, even the Doctor's emotional journey in this episode occasionally doesn't quite ring true: at certain moments he's clueless with feelings, but at other times he can effortlessly find just the right thing to say to Madge (“they are going to be sad later”). Part-time emotional intelligence guru, and part-time bumbler, perhaps this is a portrayal aiming for the “wise fool”, or the genius-child who can't understand his own feelings, but even so it still sometimes feels jarringly uneven. If motherhood is a key presence here then so too, oddly enough, is water. This is a very wet Christmas Special. Following on from River and the Ponds, this time out we get “frightful” acid rain, a lemonade tap, a water pistol used as a carol-singing deterrent, and “humany wumany” happy crying in the Doctor's Christmas homecoming. Across the hour we move from a bombastic Star Wars-meets-James Bond pre-credits sequence (surely designed to make the audience sit up and pay attention) to a domestic Doctor-greets-the-Ponds ending. The latter could hardly be any less special effects' intensive, and you definitely have to pay careful attention to get it, as finally a glistening smear of “happy crying” appears below Matt Smith's left eye. People can't resist a door, and neither can the Time Lord as he crosses the threshold into Amy and Rory's home. For the eleventh Doctor, an ordinary front door can be just as much of a dimensional portal as his present to the Arwells – this time, it's a door which transports him into a new world of emotional wonder, and a newfound humanity. The gimmicky wimmicky of “sciency wiency” workbenches or “humany wumany” crying might be wearing just a tiny bit thin by this point, I suspect, but no doubt it'll see us through to the forthcoming anniversary-wersary. Hold on to your hats, then, because the eleventh Doctor is growing up before our very eyes. He's very much linked to the children Lily and Cyril via his repeated “I know!” early on in this story, and he fails to be a proper (adult) caretaker, unlike Madge who he thanks for “taking care” of him. He even gets told off for not giving Amy and Rory a status update on his vital signs, with Matt Smith playing the “yes, Mum” scene to chastened perfection. But by the time the end-credits fly past, this Doctor is a little bit more of a time-travelling adult, and just a fraction closer to being a Time Lord grown-up. And the possibility of a return visit to Madge Arwell's life has also been deftly sketched in. This Christmas Special isn't really about Narnia, or portals, or wooden aliens. All these things are, after all, just the decorations on the tree. Underneath the glitter of Farren Blackburn's direction (solid on The Fades and solid here), and underneath the glitz of Stephan Pehrsson's ongoing great work as DoP, this episode's roots and branches are infused with the magic of maternal care. Even the Doctor is “weak” in comparison, it would seem. Yet the TV “mothership” – Doctor Who itself – continues to be strong, even towards the end of a year where its spin-offs Torchwood and The Sarah Jane Adventures were either put on hold or came to an end, and where Doctor Who Confidential was abruptly consigned to television history. So many unhappy realities getting in the way of the fiction. Nobody should be alone at Christmas, but this year BBC Wales' Doctor Who is notably more alone in the schedules without all of its spin-off family, and if I were to shed a metaphorical tear for that fact then it'd be sad crying, not happy crying, which would glisten damply at the end of Who's 2011. One of the results of 2011’s split-season of Doctor Who was that there were double the number of “event” episodes – that is, season-openers and season finales. Murray Gold draws attention to this in his liner notes: “There were four musically challenging stories (first and last episodes always need a certain amount of extra impact).” I for one am very glad that Murray rose to this challenge wholeheartedly, because it has led to an outstanding album packed with a broad range of moods and genres (yet still following a single story arc), and one that will be a favourite of mine for a long time. Disc One kicks off in funky nonchalance with some familiar chords performed by Murray himself on electric guitar. A casual but charged percussive riff joins in, before the whole orchestra explodes into a thrillingly revamped version of the Eleventh Doctor’s theme – “I Am The Doctor In Utah”. With track two, “1969”, we find ourselves in tense, mysterious “high noon” territory. The solo trumpet and the cloudy guitar dissolve into a magical, pained vocal as the Doctor begins to regenerate. Another standout track is “Help Is On Its Way”. The musical tone of these first two episodes is very consistent, and here the guitar returns with a swinging riff, while violas and violins drive forward with that familiar semiquaver figure that dates back to Series Three and “All The Strange Strange Creatures”. Somehow swanky, somehow sleazy, the brass instruments slide and swing their way in, as we are introduced to Canton (the younger). The rest of the track is a subdued but forceful string and synth underscore, building to several peaks. One of my very favourites, “I See You Silence” is the music from when River is cornered at the top of the skyscraper. The repetitive, taunting guitar motif at the start of the track perfectly echoes Canton’s sing-song call of “Doctor Song!” The track is a fuller mix than the version used in the episode, and features a funky, guitar-augmented version of the forthcoming “Majestic Tale”. The Curse of the Black Spot’s offering is excellent; an ominous start, some swashbuckling action and an enchantingly sweet but deadly vocal performance as the Siren by Halia Meguid. Add to that some vigorous fiddling by Eos Chater, and you’ve got yourself the perfect score to a pirate romp. The Doctor’s Wife also has a good selection of tracks, which work perfectly in the episode, which is perhaps surprising given the recording circumstances explained in Murray’s notes. I love the magical, lilting waltz of “My TARDIS”, but I was slightly disappointed that it was cut short, without venturing into the guttural cello and drum-machine vamp from Amy and Rory’s chase through the TARDIS corridors. I can’t complain though – there is enough terrific material packed into this album to more than make up for it! That said, there is a lot of material from The Rebel Flesh and The Almost People – perhaps too much. The tracks from these episodes are all quite similar-sounding, and not especially memorable. That’s on first listen though – given time, I have a suspicion I will grow to love these tracks just as much as the others. The last track from this story, “Loving Isn’t Knowing”, is a suite containing some really great music: the vulnerable love theme with tearful violin; the gorgeously simplistic yet soaringly lyrical return to “Amy’s Theme”; the shocking and heart-wrenching music from the realisation that Amy is a Ganger; and the terrifying Madam Kovarian music as the real Amy wakes up on Demons’ Run. The music from the mid-series finale, A Good Man Goes To War, is wonderful. It’s hard to believe that this is not the full orchestra and just a “good sized band”. “River’s Waltz” is gentle and sentimental, played on a detuned piano, here with more instruments accompanying it. At the end of this episode, when River reveals her identity to the Doctor, we aren’t told or shown immediately what the revelation is. However, from Murray’s music, we know it’s not a bad thing. As realisation dawns on the Doctor, gentle piano and cello melodies blossom into a beautiful, flowing tune, deepening in grandeur with horns until, as the Doctor inexplicably disappears in the TARDIS, out comes a majestic and moving reprise of the “I Am The Doctor” motif. 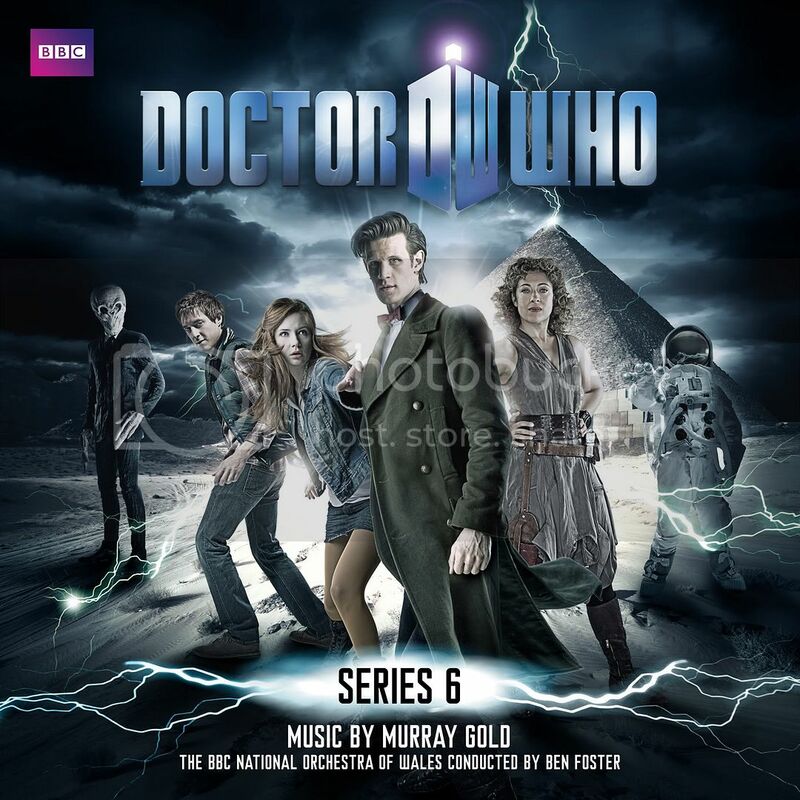 The final track on this disc, “Melody Pond”, begins with a vocal version of River’s theme as heard in The Impossible Astronaut. The second half of the track is the theme that has accompanied River throughout the series; an emotional vocal with a repeating string pattern, ending with a soaring development and orchestral flourish. Disc Two begins with tracks from Let’s Kill Hitler. “Growing Up Fast” is brilliantly nostalgic and frivolous, painting the perfect picture of the childhood of Amy, Rory and Mels. With its bouncing acoustic guitars, jumpy percussion and nursery-rhyme melody, it almost sounds as if it could be a theme tune from children’s TV. “The Blush Of Love” is rich and gorgeous. It sounds like a film score – the attention to detail is remarkable (I suspect credit is due here largely to Ben Foster’s orchestration). I particularly like the way the melody passes between the oboe, flute and violin. “Terror of the Reich” begins with a bombastic Nazi march. The second half of the track is excellent – a little bit Bond. The bopping drum machine and quirky woodwind perfectly capture the twee-ness of a robot operated by lots of miniature people! Mark Gatiss’ Night Terrors was the first time we heard the “Tick Tock” theme, presented mainly instrumentally in this episode. There’s something very scary about simple child-like music, particularly as it gradually, barely-perceptibly, gets faster throughout the track, as if it’s liable to go out of control. The sound-world of The Girl Who Waited was one of slightly out-of-tune electronic sounds, as exemplified in the first track, “Apalapucia”. This was perfect for the strange, clinical setting and the slipping of time-streams. “Amy’s Theme” returns in “36 Years”, in a reflective acoustic guitar version. I can’t hear this track without remembering the glum-looking Rory skipping along to it! If you thought the sounds of The Girl Who Waited were weird, they’re nothing compared to The God Complex. Murray says in his notes that they decided to go for an electronic score to “emphasise the crooked angles and giddy mixture of merriment and terror portrayed in the episode”. This definitely worked. The result is disorienting, very scary, slightly ironic and just fantastic. That said, I don’t think the Doctor Who Fan Orchestra will be attempting it any time soon! Gareth Roberts’ Closing Time was a superb follow-up to 2010’s The Lodger. Motifs from the earlier episode returned, such as “You Must Like It Here”, which shows up in “Stormageddon, Dark Lord Of All”, and “Thank You Craig”, which is echoed in “Fragrance”. The sound of Closing Time is much more filmic, and somehow weightier; it really feels as if we are revisiting the world of The Lodger but with a fresh approach, and, of course, the shadow of the Doctor’s oncoming death looming over. The final episode of the season, The Wedding of River Song, opened with a bang. A montage showing “all of time” happening at once was accompanied by an epic rock track, “5:02 PM”, featuring a loud choir, electric guitars and saxes. In “Forgiven”, the theme from “Melody Pond” (also foreshadowed in Series Five’s “A River Of Tears”) comes to a breathtaking resolution, breaking into a reprise with similar orchestration to “The Sad Man With A Box”. “Time Is Moving” is a funky, jazzy riff on the Eleventh Doctor’s theme, with locomotive-style percussion (appropriate to its usage in the “train-office” scene near the beginning of the episode). The episode’s namesake track is a final reflection on River’s theme, building to darkly emotional horns and gentle flutes and glockenspiel. After a rock interlude, we hear a brief nod to Amy’s child theme, on a beautiful solo flute (in fact lifted from “Amy’s Starless Life”). And yes – the very last track was put in at the special request of the many Twitter users who asked for it. Murray is quite right – it’s a fitting end to the album, and encapsulates all we love about the Eleventh Doctor and his adventures. The overall tone of this album is much subtler than any of the previous Doctor Who soundtrack releases. It covers a wide spectrum, but it definitely feels consistent. The music of Doctor Who has been becoming more and more filmic since 2005, and this album is the absolute pinnacle on that front. I look forward hugely to hearing what Murray Gold comes up with for the next series! Stephen Willis is the creator of The Doctor Who Fan Orchestra. You can read his review of the Series 5 soundtrack here.